"Artist Gwyneth Leech has proven there’s no such thing as an idle moment. 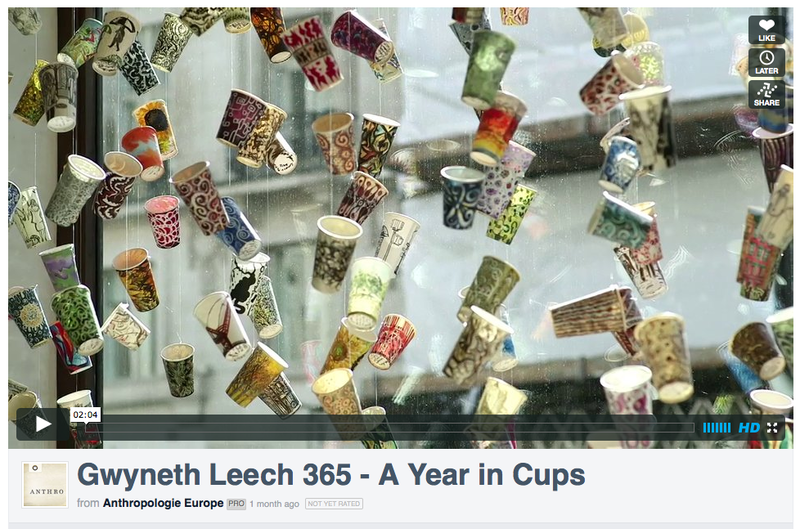 When her workplace replaced Styrofoam cups with paper ones, Leech began using them to draw on – everything from abstract patterns to street scenes – and the cups now fetch £300 each. 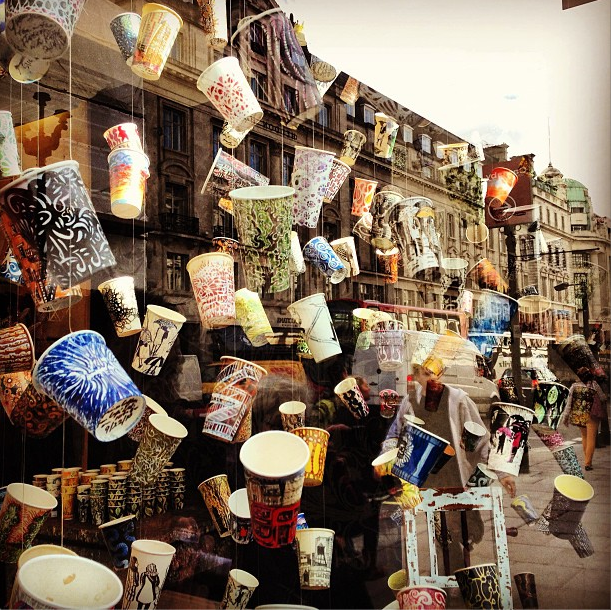 At last month’s London Design Festival she sat in the window of Anthropologie’s Regent Street store (above) illustrating dozens of the throwaway receptacles she has called her “muse and inspiration”. You can now sip your coffee from one of Anthropologie’s porcelain (and considerably cheaper) versions." Click here to read more. "Opening on Sunday in the windows of Anthropologie in Regent Street is the slightly more low-key, yet no less eye-catching installation by New York artist Gwyneth Leech. She has hand-decorated one paper coffee cup for each day of the year, drawing on street scenes or expressive abstract designs for inspiration. Once finished, the cups are signed on the bottom with the date, location and beverage the cup held and then preserved using an encaustic method that has been used for centuries. 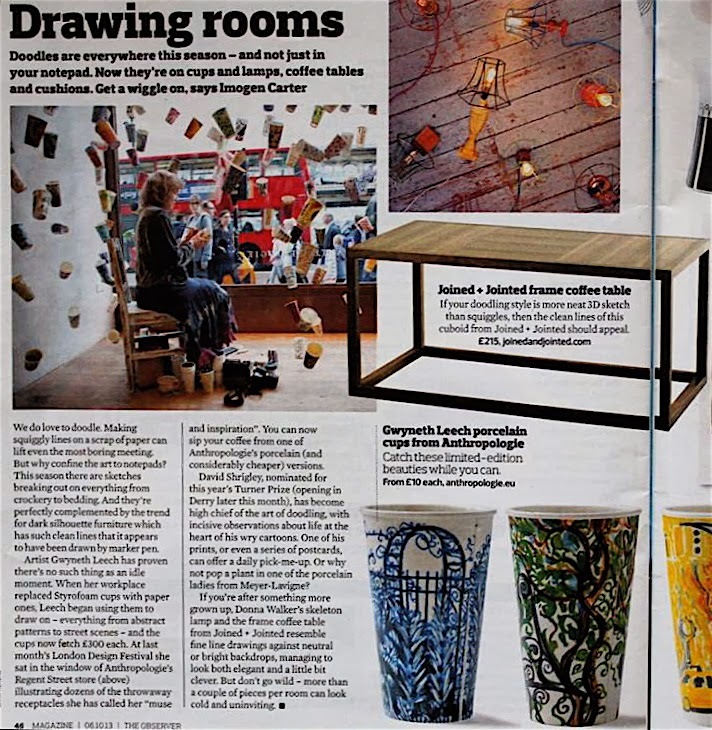 Leech will be present at the exhibition for five days, creating new works and on hand to talk about the creative process involved"
The Telegraph 06 Sep 2013 "Gwyneth Leech: the art of paper cups"
Having captivated New York with paper-cup art, Gwyneth Leech is coming to London. "Leech paints only on used cups, either her own or kept for her by friends; waste is avoided through art. She preserves them with an encaustic process (used by the Romans to preserve artwork on tombs) after working on them with gouache, watercolour, oil paint or Faber-Castell art pens. The cups are graphic and colourful, depicting street scenes, people, architecture or park landscapes. On the base of every one, along with her signature, she writes the date, location, occasion and beverage consumed, so that each cup becomes a record of a social moment." Click here to read more. "For almost five months, one of the busiest intersections in New York City has been transformed — by the unlikely medium of 800 used paper coffee cups hung from fishing line — into an enchanted cleft in the canyons, a place of visual delight and surprising tranquillity. The cups, on which the artist Gwyneth Leech has drawn or painted vibrant graphic patterns and imagery, fill the glass-enclosed “prow” at the base of the Flatiron Building, on 23rd Street, between Broadway and Fifth Avenue. Suspended in space, they move gently, too, as heat currents rise from the floor registers. It’s a public art installation for which no invitation is needed. Passers-by simply stop — amused, astonished, perplexed, engaged. Or they come by, as Michael Munguia did the other day from Bedford-Stuyvesant, Brooklyn, because their friends have told them they must see the lady who draws on coffee cups. "Gwyneth Leech has the coolest studio in New York." "Dancing around in the uplighting and circulating air of the space, the cups are in one sense a fanciful play on a disposable (and highly caffeinated) culture. But Leech's presence also makes this an installation about the process of making art and turning trash into treasure." Click to read more. "Gwyneth Leech drinks coffee and tea. While attending the endless meetings and events required by New York's civil society she, in lieu of note paper, began using her paper cups as a surface to write on. Intrigued by the supple texture and inviting shape, Leech was soon making full fledged drawings on the cups. 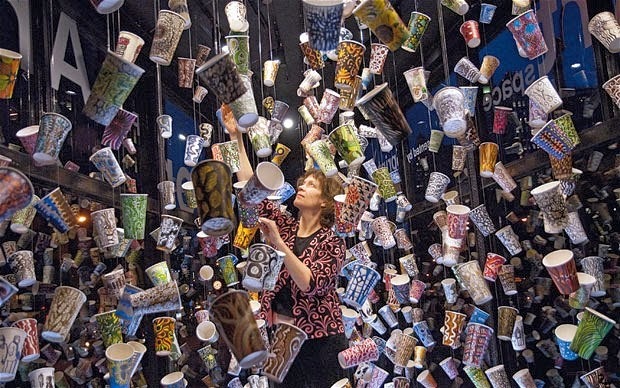 After several years of collecting and decorating over 400 cups she arranged to present an installation/performance of her practice in the street level window of the "Sprint Prow Artspace" in the World famous Flatiron building. 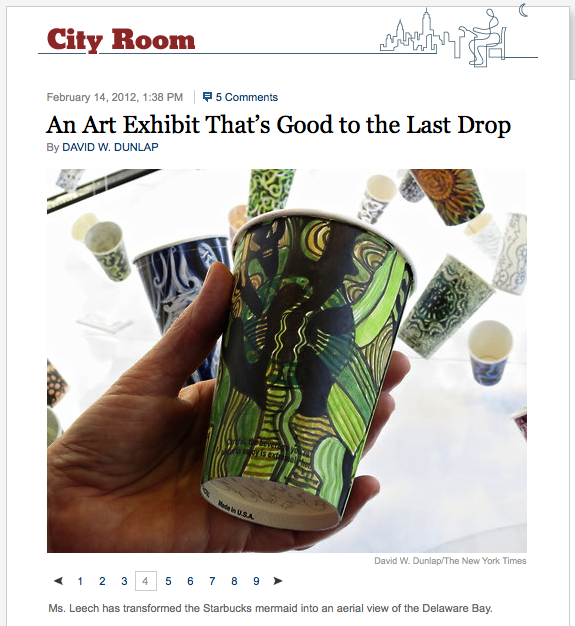 After nearly five months, the artist has completed around 800 cups, and is displaying them in one of Manhattan's most visible and unique locations" Click here to view video. "The simplicity of this project and its message–that everyday objects have multiple uses, and should be repurposed–creates a playful and lively yet calming center for one of the city’s busier atmospheres. Amidst all the traffic, passersby have the opportunity to experience a thought-provoking artistic intervention." "The message that the little every day things we do that produce waste can be transformed into something awe inspiring is something to think about." Catch that last part? Each cup documents a “social moment”. Every single cup suspended so delicately in midair symbolizes a personal interaction, an exchange of stories or ideas, a connection with another human being. All of these social moments are then made into art, and displayed to hundreds of onlookers sparking new social moments, ideas, stories, and connections." "Gwyneth Leech in the Flatiron Prow Art Space"
"We like the way it looks from a distance, especially at night, a beckoning jewel box of light and color; we like the way it looks up close, each coffee cup its own work of art, all of varying compositions, subjects, styles and palettes. Adding to the magic is the way Leech suspends her pieces floor to ceiling, filling the space with her designs." "A Flatiron District neighborhood treasure." 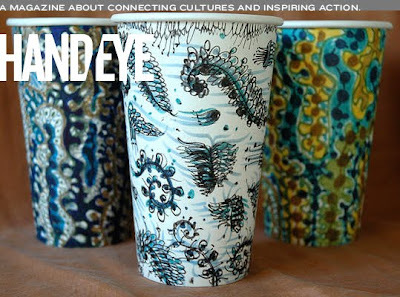 Gadling "Used Coffee Cup Art in New York City"
"Haven't you ever found yourself pacing along with the quick-moving, coffee-cup-holding crowds of NYC wondering, "What if all of those coffee cups could somehow be collected to make an amazing used coffee cup art?" Admittedly, I haven't ever had that thought, either. But I'm happy someone did." "Gwyneth draws fractal patterns on her morning coffee cup and on those contributed by her friends. Then she adds them to her ever-growing mobile. Her obsessive drawing is called Hypergraphia in some circles–but it’s Art with a capital A to the Trashman. Best of all, those cups aren’t litter." "Hypergraphia is right. Designs flow out of the artist’s pen like the house blend out of a deli spigot at breakfast. Leech is prolific. The results suggest Italian pottery, Greek vases, paisley prints, tattoos, cuneiform script and more—a range of contemporary abstraction. And, if I may say so, the installation is really fun. It’s interactive in that people on the street stop to look at the cascade of cups, then spying Leech in the corner, painting, call their friends over to come and look. “She musta drunk $900 worth of coffee,” said one hip-hop homie to another (I’m guessing more), as they paused to take in the range of graphic expression. But others are drawn in by the artist drawing. Those of us “in the life” forget just how fascinating it is to watch someone make something out nothing, or in this instance, a white paper cup. "As you speak with Leech and get to know her work, you realize Full Brew encapsulates the essence not of all her work but of how she approaches art-making—and her life as artist, mother, daughter, New Yorker, friend, sister. A few things matter most up front. They don’t compete. They all coexist. Leech cares about the place where she lives, the people in it, the landscape, and the way she sees and responds to all of it. Her work—including short videos about artists and dancers she’s gotten to know, paintings of diverse families, images of familiar landscapes viewed from different vantage points, photographs of playgrounds and parks—weaves together her world and her intimate, seamless responses".